Projects in the Champion lab generally apply protein engineering strategies to naturally occuring proteins in order to synthesize novel materials capable of specific interations with cells or other proteins. The overall goal is to reverse disease through interference with immune function, inflammatory pathways or promotion of healing mechanisms. We create materials for targeting many diseases, including breast cancer, hematologic cancers, inflammatory bowel disease, diabetes, and wound healing. Inflammation is the body’s response to perceived threats. Immune cells are recruited to the site of inflammation and secrete signaling molecules called cytokines to direct cellular activity. Chronic or prolonged inflammation is the hallmark of autoimmune diseases, such as inflammatory bowel disease and rheumatoid arthritis, that can cause pain and cell death due to these cytokines. We utilize AvrA, a bacterial effector enzyme derived from Salmonella, as a novel therapeutic for autoimmune diseases. AvrA is a naturally evolved enzyme capable of disrupting inflammatory and apoptotic signaling pathways inside the cell preventing release of cytokines. To deliver this therapeutic we have engineered a protein nanoparticle delivery system encapsulating AvrA that enhances intracellular delivery and ameliorates the symptoms of inflammation. Further research focuses on engineering an alginate/chitosan oral delivery vehicle capable of gastric protection and intestinal release of anti-inflammatory protein therapeutics. Subunit vaccines made from pathogen proteins are emerging as an alternative to traditional whole-pathogen vaccines. A few recombinantly-expressed, conserved viral proteins could direct the immune system to generate protective antibodies against many subtypes of viruses, providing a platform for a universal vaccines. 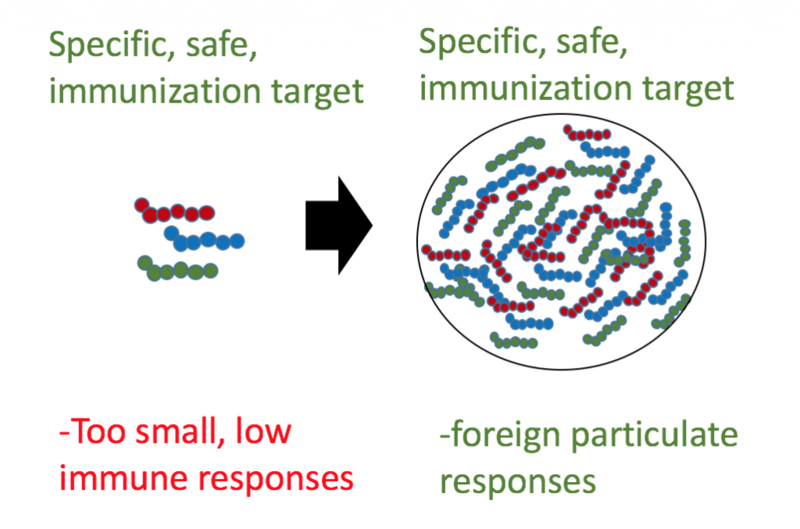 Similarly, small peptide vaccines can induce specific responses to viruses or bacteria without the need to inject excess material from the pathogen that could produce off-target reactions in the body. However, the poor immunogenicity of these conserved proteins or peptide epitopes means strong immune responses are rare. A major challenge for vaccine design is how to safely enhance the body’s reaction to these proteins. By making nanoparticles from crosslinked antigen proteins and peptides, we are leveraging the immune system’s inflammatory reactions to particulate matter to boost the body’s immune responses to our antigens. The antigen protein nanoparticle is both an immunization target and a biodegradable, immunogenic delivery vehicle, in contrast to traditional particulate adjuvants such as alum or synthetic polymer nanoparticle carriers. We are exploring how these protein nanoparticles can be engineered to trigger protective immune responses for diseases that do not currently have effective vaccines available. In both industry and therapeutic drug-delivery, soluble enzymes are subject to degradation or loss of activity due to fluctuations in temperature, pH, and concentration of other solutes. However, enzymes can perform chemical reactions in a greener fashion than typical chemical processes, and have the potential to serve as therapeutic agents. Enzymes fused to binding domains can immobilize onto self-assembled protein-inorganic supraparticles, improving their activity and stability over a variety of conditions. The modularity of the system opens the door to many avenues of application. Current areas of interest are to create an industrially applicable biocatalyst for the enzymatic synthesis of pharmaceutical precursors, as well as investigate the activity and biocompatibility of anti-inflammatory enzymes immobilized onto supraparticles as a therapeutic material. Vesicles assembled from folded, globular proteins have potential for biocompatibility, robustness, tunability and specific bioactivity based on the chosen protein sequence, compared to typical lipid and polymeric vesicles. The first goal of this research project is to identify fundamental structural knowledge of the phase transition of recombinant fusion proteins containing globule, zipper, and elastin-like polypeptide domain into vesicles upon various self-assembly conditions. Based on the fundamental information, this work will be expanded to create functional protein vesicles with controlled properties assembled from bioactive globular proteins. This project combines detailed structure characterization, with recombinant protein materials fabrication, and biofunctional assessment of vesicles for delivery to cells. 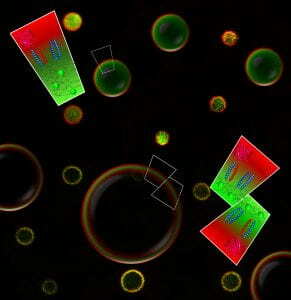 This research will reveal the structural phase diagram of self-assembled globule-rod-coil protein complexes, determine tuning parameters of vesicle properties, identify the breadth of proteins and cargoes feasible for incorporation in the protein vesicles, and demonstrate functional proof of concept for biomedical applications. During wound healing, cells infiltrate the damaged tissue and deposit a temporary extracellular matrix, which is rich in a protein called fibronectin. The cells then remodel the temporary matrix, resulting in restored and functional tissue. However, some wounds do not heal properly and result in scar tissue. Bioactive materials that promote proper wound healing and tissue regeneration are urgently needed, particularly by those who experience chronic reinjury, such as diabetic sores. Inorporating fibronectin, or fibronectin fragments, into an engineered biomaterial has been shown to promote cell adhesion to the biomaterial. However, in order to heal the wound, cells must subsequently remodel the surrounding extracellular matrix. Typical methods of incorporating fibronectin into biomaterials include covalent bonding to the scaffold or adsorption to the scaffold. Covalently attached fibronectin is “anchored” to the scaffold and cannot be moved, whereas adsorbed fibronectin quickly washes away from the scaffold. A third method of incorporating fibronectin is to use protein affinity interactions, which are reversible noncovalent interactions dependent on protein structure and sequence. The strength of affinity interactions may be tuned, allowing fibronectin to be retained on the scaffold without being permanently anchored. We are exploring whether incorporating fibronectin into a biomaterial by affinity interactions promotes cellular remodeling behavior, leading to functional wound healing. Antibody therapeutics are a significant and rapidly growing class of drugs on the market and in development for treating cancers, neurological, and autoimmune diseases. These therapies primarily work by binding targets found in blood plasma or on the surface of cells, thereby modulating cellular pathways to alter cell behavior and achieve a therapeutic outcome. While many extracellular “druggable” targets have been identified and explored for antibody therapeutics, the ability to deliver antibodies intracellularly in their functional, native conformation would considerably expand the possibilities for therapeutic targets and outcomes.To deliver antibodies intracellularly, we have developed a hexameric protein nanocarrier (Hex) that can bind up to 6 antibodies at a time. 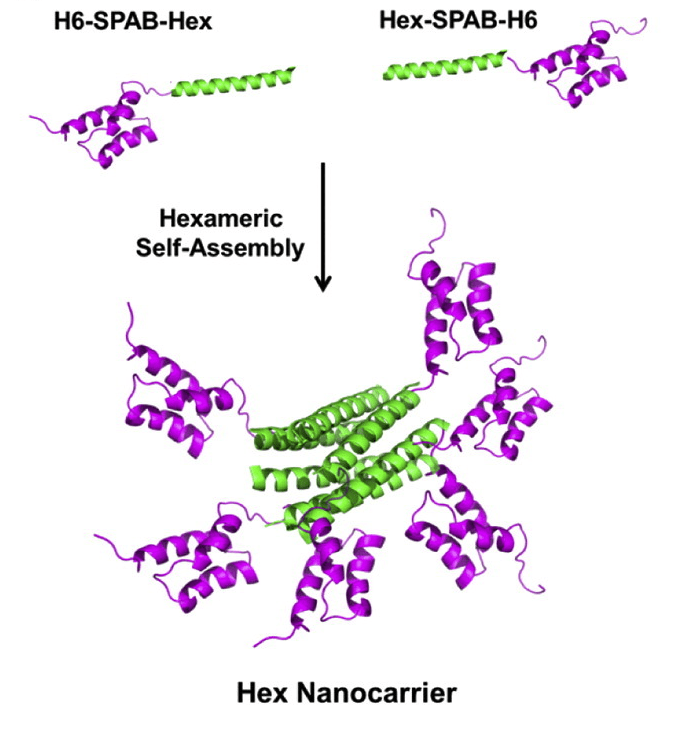 The Hex protein is composed of a self assembling hexamer core fused to six antibody-binding domains, allowing for a higher drug loading than many reported drug delivery vehicles. We have previously demonstrated successful delivery of both nonspecific and functional antibodies to their targets inside of cancer cells. Delivery of fluorescently labeled anti-nuclear pore complex antibodies bound to Hex showed fluorescent staining of nuclear membranes in cancer cells. 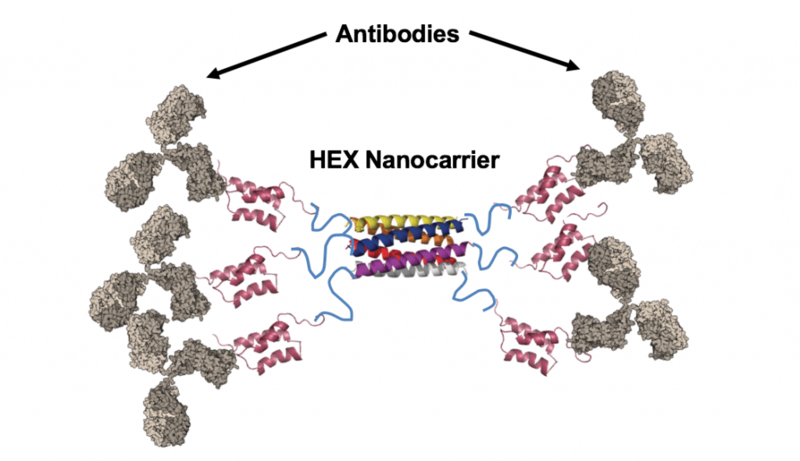 Future work involves delivery of functional, therapeutic antibodies to cells with the nanocarrier and assessing the performance of the Hex nano carrier in vivo.